Have you ever wanted that fresh out of the ocean or pool wavy hair look without having to hit the beach or pool beforehand? There are all kinds of beach sprays on the market but why spend the money when you probably have all the ingredients right at home. Mix ingredients and pour into a spray bottle. This homemade sea salt spray is best used on damp hair. Spray the mixture onto your damp hair and scrunch. For longer lasting waves, especially if you have straight hair like myself, spray on damp and braid your hair. Leave it braided over night and respray in the morning. 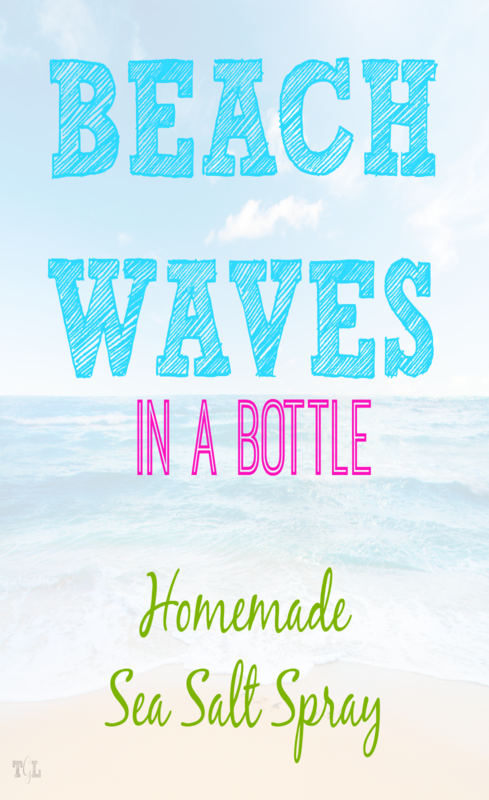 I love this homemade spray because the name brand Surf Spray costs around $30 for a 4 oz bottle. Yikes! It’s a great product if you don’t want to make your own spray but definitely pricey. Do you like making homemade beauty products? Check out my other homemade beauty recipes below. I have thick, wavy hair and I find that just simply scrunching it after spraying does absolutely nothing and I don’t know why! So even with my wavy hair, I have to use the braid and leave overnight method. Yeah, I have thick hair too and it weighs all the waves and curl down when I try to curl my hair. I usually have to braid as well to get the best results. Sounds fun. I wonder if it would work on my totally straight hair. Hi, I was wondering how much water do you use to make this up. I am not sure how much to put in the bottle because my daughter has thick curly hair and I would like to make this for her. Thanks.